After the article is re-formatted and updated, remove this notice and the Review Required category. Some older tutorials are no longer useful, or they duplicate information from other tutorials and entity guides. In this case, delete the page after merging any relevant information into other pages. Contact an admin to delete a page. Elevators with Moving Doors There have been a lot of questions about elevator doors. The main one being "Why can't I have the doors that move with the elevator, you know like a normal one?". 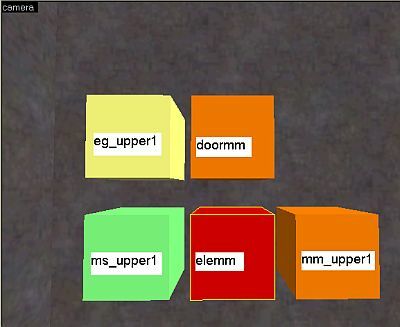 The main reason is that Half-Life wasn't coded to include entities that move with other entities. Q. "But Day of Defeat and NS have moving entities, that are combined?". A. Yeah, these Modifications use Spirit and that allows mappers a greater choice of how to use their entities. But that doesn't solve the problem. So how do I get the doors to move with the elevator? The trick to this is to make the doors follow their own path_corners just the way the elevator does. If you haven't built an elevator before have a look at Atom's 'Elevator's using func_train' tutorial. This tutorial is not a beginners guide to elevator building, it assumes you have an understanding of a lot of things....And if you don't quite get it first time, try it again, check the settings and ask yourself "What the entities are doing?". This tutorial is designed to make you think! Build a basic elevator by making a cube brush the size you want (although it has to be bigger than the player, so I have used a 128 x 128 unit cube). Hollow the cube at a wall thickness of 4 but don't turn it into a func_train just yet. Using a square shape will make it easier until you understand the concepts involved. In your map place the first path_corner directly in the center of the box you have created. You can use the center points as a guide. Select the box and look in the 2D views, see how there is a small grey cross in the center of the box in each view?, well that is the actual center of the box, and that is where the path_corner needs to be. No need to assign attributes to the path_corner just yet, as we haven't created the elevator. For the time being, I want the path_corner there to help with the placement of the door paths. Q.Why did I make the Elevator a cube? A.Because things move at different speeds, depending on the distance they have to travel. Distance to path_corners is critical...... physics! Select the side of the elevator you want as the entry doors. Highlight the brush and clip it in half, making sure the doors are now the same dimensions. Dont forget to ungroup the doors after clipping, alternately you can create seperate brushes. I find it easier to make the doors cover the whole front area of the Car Cube, and recess the wall and ceiling brushes to fit. Now select Door 1 and assign it to the func_train entity. Name it door1 and give it a first stop target of door1_pc2. Do the same with the other door, calling it door2 with a first stop target of door2_pc2. 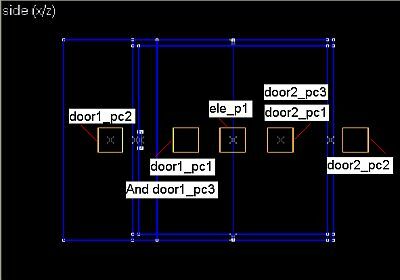 Place path_corners at the dead center of each door, then move one door to the place you want it to be in the open position and place another path_corner at the dead center of the door in the open position. 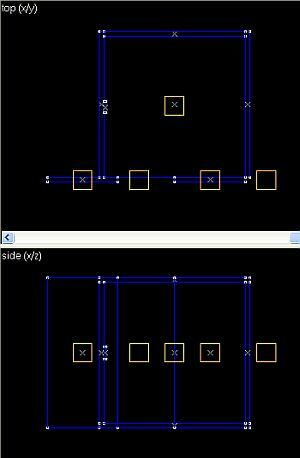 In the image below I have left one of the doors in the open position to illustrate the path_corner positioning. Place 2 more path_corners at the same place as each of the original 'door closed'pc1 path_corners. I normally move this corner forward a few units to make it easier to select them, when I adjust their attributes. You should have 7 path_corners placed in your map, 6 for the doors and one for the elevator. I am going to cheat slightly, because we are going to create an elevator that you can only access from one side. (The rmf has two examples, this one and a walk through type). Select all the path_corners and copy them. Then move them down your map and align them directly below the original one's. You will also need to add a small trigger brush tied to the func_button or func_rot_button entity, that will act as the call button. Place a normal brush inside the elevator, where you want the button to be, and texture it with a button texture. Place the func_button in the same space as the imaginary textured button. Copy all these and position them in the same relative position with the lower path_corners. Their position isn't critical, but the trigger brush is. Make sure it is in the same position as it's upper counterpart. I have placed mine in the middle of the elevator wall. The reason I didn't make the elevator a func_train was that I wanted to have the button in place, because the button will move with the elevator. Select all the elevator brushes (Not the doors), including the fake call button and tie them to the func_train entity. Give it a Name (targetname) of ele and a First Stop target of ele_p1. The func_button should not be part of the elevator group! The path_corners Time to sort out the path_corners. We have two distinct groups of entities. Let's start with the top ones. Fire on pass: eg_upper1 [eg_lower1 for the bottom path_corner]. Door1 PC 2 This is the path_corner that controls the open door. Door1 PC 3 This is the path_corner that is in the same position as PC 1. Ok, Now duplicate the same properties and attributes and flags for Door 2, and name the lower path_corners starting with the PC that is in the same place as PC 1, naming it doorX_pc4 and so on, until you get to PC 6 which will have a next stop target as doorX_pc1. To get everything to work correctly, you need to set up 3 multimanagers, 1 globals and 1 multisource. For the settings of the MM (multimanager), MS (multisource) and EG (env_global), I am going to recreate the basic method of making the call buttons functional so that you can't call the elevator, or inturupt its travel while one button has been activated. 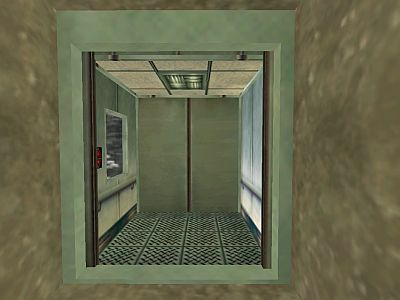 This has been discussed on heaps of other sites and the concept is not new, but I have to give credit to the old Valve-ERC site, as that is where I learnt to build elevators. Upper Call button The upper func_button must have it's target set as mm_upper1 so that it triggers the upper Multimanager, and it's Master as ms_upper1 so it takes it's State from the upper Multisource. You might want to adjust it's attributes for Render Mode to Texture and FLAG it as Not Solid. On the lower set of entities, you should have the same number of path_corners. The major difference this time is that there is no need to get the lower path_corner door1_pc6 or door2_pc6 to fire the elemm. We are going to do this with the func_button. Lower Call button The lower func_button must have it's target set as mm_lower1 so that it triggers the lower Multimanager, and it's Master as ms_lower1 so it takes it's State from the lower Multisource. You might want to adjust it's attributes for Render Mode to Texture and FLAG it as Not Solid. The main reason I stuck the multisources and globals in was that if you are thinking multiplayer, then you don't want people stopping the elevator half way down. You want to shoot them when the doors open.. Oh, I just heard someone say, but the physical button is in the elevator, and the illusionary one won't be seen. True, but they will know where it is, and if they press it using the normal set up, it will stop the elevator... the doors on the other hand will keep going, and there is a good chance that they will never be in sync again. Q. My Brain has exploded, how do you follow all this stuff? A. I don't, I was hoping you could explain it to me? Seriously, what happens is that when you press the elevator call button, the func_button hiding behind it calls mm_upper1 the upper multimanager, toggeling the upper env_global to disable the button you just pushed and fire the doors. When the doors close they fire the elemm elevator multimanager which triggers the elevator to move down. The same sequence of events occurs at the bottom of the shaft because the elevator has triggered the lower env_global via the lower path_corner and enabled it's button. Getting the doors to make sound isn't as easy as it looks. I have tried various ways of adding sound and nothing seemed to ... well... sound good. Using the sound option on the door properties will cause them to produce that sound as they travel..and that is a little weird. Because they are a func_train and not a door, means that to get them to make a closing sound would involve setting up a seperately triggered ambient_generic and using that to produce the sound... I didn't add it to this tutorial because my head was hurting anyway. So is someone out there feels creative, just modify the .rmf, add the sound and send it too me. I will immortalise your name in print for all to see. DO NOT change the speed of the elevator using the New train Speed property of the path_corners. It produces really weird effects, like creeping doors. Even if you match the New speed with the original elevator speed the doors will behave weirdly. just leave the path_corners set to 0. Make sure that the elevator and the door have the same speed settings. Once you get it running, you might have to adjust the timing of the multimanagers depending on the size of your elevator. If the doors are moving too fast, delay their firing with the door multimanager or increase the delay on the elevator multimanager. Or you can adjust the Wait Here (secs) value of the path_corners. There are probably better ways to do this, but this works. One thing that you might also consider is using multisources and globals to control the doors using the path_corners as triggers. If the player get's stuck in the doors all the other sequences will fire, leaving things in a bit of a mess. If the size of your door's are not the same as the size of the front of your elevator, they might reach their path corners quicker, and start their travel before the elevator. You will need to play with the delays on the path_corners to get them in sync. Q.My button texture wont work? A.That is because it is part of the elevator func_train and not part of a trigger. You might be able to solve this with the info_texlights side of Zoners, but I never got around to it. If you want the inside of your elevator to be lit, then you need to place a suitable light inside. Processed in a horribly vicious 2 milliseconds.